This article predates the successful water tank project. It offers a great glimpse into the lives of the people in Ishiagu and Obinagu, Nigeria. All photos copyright 2017 Uplift Help International Inc. Upon her return to New York, Sister Dolores sent her photos to Water for Life in Africa, so that their supporters could get a closer look at the conditions in this small village on the plains of the south-eastern savannah belt. 1st from left: Lindsy Cleeton (Uplift Help International Inc.) 4th from left: Dominique Jean (Publicity Secretary of UHI Inc.), a friend of Chris Okorie (6th from left) 7th from left Sr. Dolores Castellano CIJ (member of UHI Inc.) All others in the photo are family and friends of Chris Okorie. Even to Sister Dolores, who is no stranger to hard living conditions among the poor, the degree of hardship in Obinagu was striking. Recalling her visit there, Sister Dolores offered a glimpse. "Village life is very difficult. The people spend most of their days doing that which will keep them alive. That is fetching water--on foot or the more fortunate on bicycles, working on farms that are a distance from the compounds--in some cases five miles or more, preparing some food, usually very little in quantity and variety, and gathering wood for heat and cooking. Since they have little, if any, transport they, children and adults (mostly women) carry heavy loads on their heads. This leads to painful necks, backs and legs." For these people, channeling all energy to survive day by day during the dry season is a universal fact of life. Pointing to a photo of villagers peering up from their work in the receding waters of a murky stream, Dolores explains how a singular focus on the search for water becomes commonplace. "This is a photo of one of the ways the people fetch water for drinking, cooking and cleaning. The river water is contaminated and many suffer from worms, typhoid and other related diseases. Gathering water is a major event and takes time, strength and fortitude." 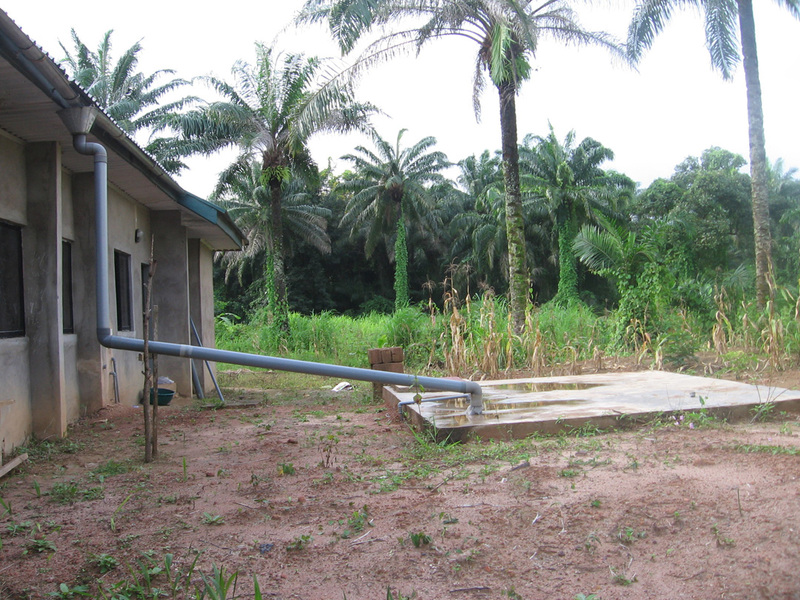 The people of Obinagu continually seek out creative ways to acquire drinkable water. "Some villagers have started harvesting rain water from the roof for storage in an underground tank. This water is also contaminated but not as badly as the river water. Most villagers cannot even afford this method of collecting water." Obinagu, nonetheless, is a village bound together with a strong culture and heritage. Upon of the arrival of Sister Dolores and her friends in Obinagu, Chris Okorie gave them a tour that included a visit to his mother's home and gravesite. "Those who die are traditionally buried next to the home they lived in." "We stopped for a prayer for her at her grave site located under the tree in front of the house." While in Ishiagu and Obinagu, Sister Dolores and her entourage immersed themselves in the rich culture of this region. "After a long season of farming with 'ancient' tools these two young men (who are uncle and nephew) sift the product of mashed and dried yams through a silt to prepare it for a final cooking and production of 'fufu'. The preparation of food is a laborious family endeavor." Sister Dolores explains the wider purpose of her trip, "Uplift Help International Inc. ran a mission to the village of Ishiagu to provide health care screenings for the people. In this photo we see the people of Ishiagu waiting to be seen by the nurses, doctors and assistants at the health care screenings held at St. Anthony's Parish. At least 700 people were seen in three days of screening." A visit to Obinagu would not be complete without a visit to the site of the Water for Life in Africa (WFLIA) project to provide drinkable water. In early 2010, Chris Okorie served as Regional Director for WFLIA’s second well drilling project. This project, and the one that preceded it in 2009, was largely funded by the generous parishioners of Our Lady of Mercy in Forest Hill, New York. The first project failed to find water, but this time the drilling company persisted with multiple drillings until they finally hit water. The successful drilling brought a sense of joy to the villagers, and hope that years of suffering from water shortages were now at an end. Unfortunately, the tests of the water taken from the well were unfavorable. A second series of tests confirmed the negative outcome: the well water contains unacceptable levels of lead. The well was shut.